This cane will probably be girdled by the twine and should not be used. Renewal spur serves as a source of canes if it becomes necessary to replace the cordon. Loose twine tie b d because they were shoot positioned. because they were shoot positioned. Fig. 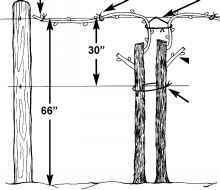 1 - Steps to training a grapevine to the Hudson River umbrella (HRU) training system: (a) an unpruned double-trunked vine after its second year of growth; (b) an expanded view of the top of a 2-year-old trunk indicating that the cane at the top will probably not be useful because it will be girdled by the twine; (c) vine after pruning to retain the long canes to establish cordons and renewal spurs; (d) vine after being tied to the trellis; (e) unpruned vine after its third growing season; (f) (see next page) vine after it is pruned and tied in preparation for its fourth growing season and those thereafter. ous year are developing a rough-textured bark. After the leaves fall from the vine in the fall, the rough bark characteristic of the 2-year-old or older portions of the vine distinguishes them from the smooth-barked current-year canes. Canes, the smooth-barked woody parts of the vine, are very important to the grower. They have enlarged areas along them called nodes (Fig. 1c). A node is a compound bud composed of: a primary bud, which typically produces two-thirds or more of the fruit; a secondary bud, which produces up to one-third of the fruit; and a tertiary bud, which produces little or no fruit (Fig. 2a). The smooth areas of a cane between the nodes are called internodes (Fig. 1c). Canes may be pruned to varying lengths. If they are pruned to one to three nodes, they are called fruiting spurs. Canes left longer and pruned to four or more nodes are called fruiting canes. Fruiting spurs are seldom used for table grape production in a temperate climate because the nodes at the base of canes often produce small, straggly clusters. Therefore, fruiting canes with at least 6 and up to 15 nodes are typically used for temperate climate table grape production (Fig. 1f). A vine must be managed to occupy its own specific space along a vineyard trellis. The portion of a trellis reserved for a vine is called its vine space. A vine is contained within its vine space through a combination of vine management practices including choice of training system, pruning, shoot positioning and fertilization. The renewal zone of a grapevine is the area within that vine space from which fruiting canes (or fruiting spurs, when these are used) originate. The precise location and shape of a renewal zone will depend on the vine training system being utilized. For example, when a modified 4-arm Kniffin training system is utilized (Fig. 3b), the fruiting canes originate from a renewal zone in the middle of the vine space near the top wire of the trellis. 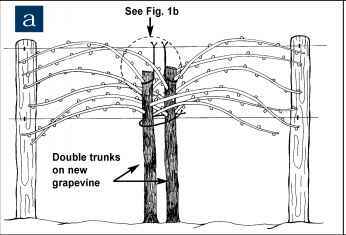 Therefore, in this example, an experienced pruner's eyes will concentrate on that portion of the vine to locate the desired fruiting canes. The concept of a renewal zone is important because it focuses the pruner's search for fruiting canes. 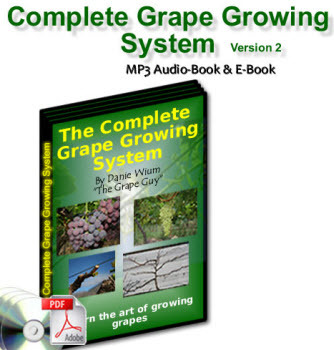 There is no need to comprehend the entire tangled structure of a vine to prune it properly. Fig. 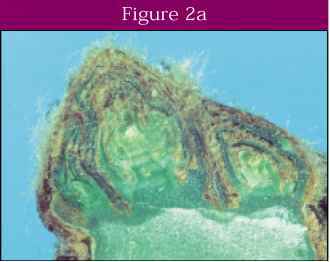 2a - A longisectional view of a grape node revealing a primary (center), secondary (right) and tertiary (left) bud surrounded by bud scales. tices have not encouraged shoot growth in that area of the vine. 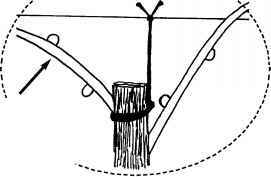 Therefore, a grapevine pruner must manage the structure of a vine not only for fruiting in the coming growing season but also to preserve the form of the vine for future years. Managing the structure of the vine for future years is accomplished by creating renewal spurs. These are canes in the renewal zone of the vine that are not chosen for fruiting but are pruned to one or two nodes (Figs. 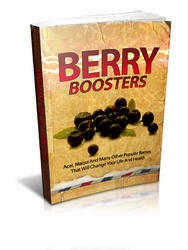 1f & 3b) to promote shoot growth. The expectation is that some of the shoots arising from renewal spurs will mature into quality fruiting canes for the following season. 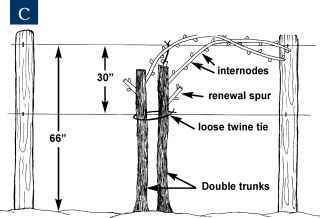 Retaining ample renewal spurs makes pruning easier in subsequent years. However, it is also possible to go "spur crazy". Saving too many renewal spurs causes shoots in the renewal zone to become crowded and develop poorly. Therefore, a general guideline is to create one renewal spur for each fruiting cane left on the vine. How to grow cordons from old grape vine trunks?